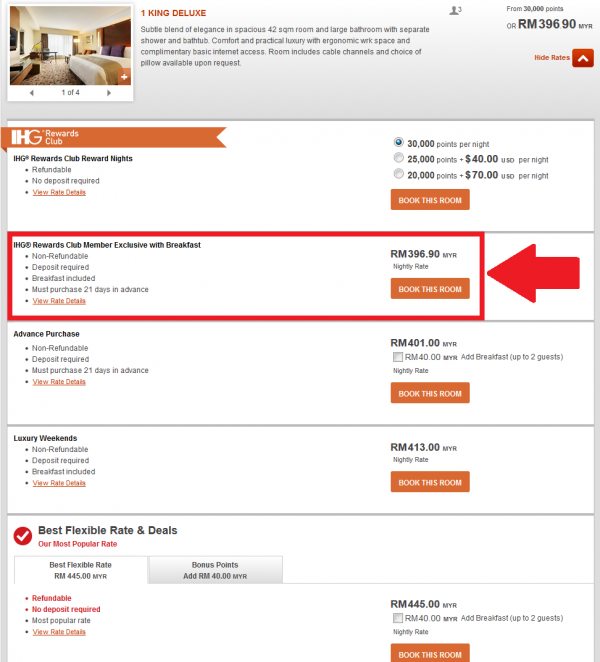 IHG Rewards Club has new 25% off stay offer at participating hotels in Asia, Middle East & Africa until December 31, 2014, that are booked by September 30. IHG Reward Club members are eligible for further 10% discount that brings the total maximum discount up to 35% off. Note that Greater China (China, Hong Kong, Macau & Taiwan) are excluded from this offer. The Member Exclusive rate that includes breakfast was the lowest one for a weekend night in September. It could be worth keeping this rate plan in mind, although I am not sure how widespread the property participation is. I tried maybe five properties and the InterContinental Kuala Lumpur was the only one that I was able to pull up this rate. You must be an IHG® Rewards Club Member to be eligible for this promotion. Rates are per room, per night and are subject to availability. Offer includes up to 35% off room rates. Tax and service charges apply. Final bill will be presented in local currency. Full prepayment is required at time of booking, cannot be amended and is non-refundable. Credit card surcharges apply. Blackout dates apply. Rates for the participating hotels are available until 30 September 2014. A minimum length of stay may apply. Please check with the hotel directly should you require further clarification. Stay must be completed by 31 December 2014. Offer is not valid to groups of 10 or more rooms and cannot be combined with any other special offer, including but not limited to InterContinental Ambassador’s complimentary weekend night certificate. At Holiday Inn, Kids 17 years and under stay for free sharing parent’s guest room in existing bedding. At Holiday Inn, Kids 12 years and under eat free from the all-day dining restaurant with an accompanying paying adult guest. Rates qualify for IHG® Rewards Club Points.